Oh the classic Shirt Dress. It has come and gone throughout the years as a staple in a woman’s wardrobe and I’m happy to say it’s back. You can wear it casual and fun like this one from Old Navy. Or go the more sophisticated route like this one from Michael Kors. I absolutely love them both and can think of a place or event where I could wear them. Here are many more looks, as well as different styles of shirt dresses, pulled from here, there and everywhere! 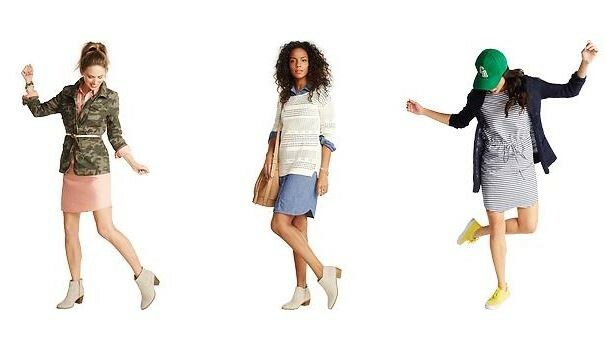 Old Navy gives several great ways to wear a shirt dress and it’s all about layering and getting creative. Wear your favorite blazer over it or a light spring sweater. Pair a camo jacket with the buzz orange color and then belt it. The shirt dress can also go with sneakers, booties, sandals…need I go on? Versatility at its finest! Victoria’s Secret has some fabulous Shirt Dresses and they’re on sale. You can wear it casual with a cute beanie or dress it up. Here are a couple of examples. Here’s a Shirt Dress Outfit I created based off of Alessandra Ambrosio who was spotted out and about in Los Angeles wearing a shirt dress. I believe hers is black, but as you can see, this works with the classic navy color as well. Previous articleCents of Style: Statement Necklace Blowout- $5.95 & FREE SHIPPING Today Only! I love shirt dresses!!! There are so many great options. They are so versatile!!!! !